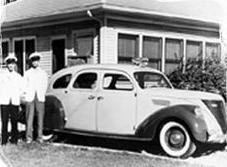 Trout Funeral Home was founded as a family business in November of 1936 by Ernest M. Trout and his three sons, Ernest M. Jr., Jack, and Jim. The original funeral home was located at the corner of Oak and Grand Avenue. The Trout family purchased the present facility in 1943 from the estate of C.F. Calkins, early Kay County pioneer. The building originally served as the bank at Cross before being moved to Ponca City to the corner of First and Grand to become the First National Bank. It was moved to its present location in 1907 and, after some additions to the structure, became a private home. The home faced Elm Street until April 5, 1912, when it was damaged by a tornado. The Greek Revival style home was rebuilt facing Grand Avenue and the three floored nine thousand square foot building was the town's largest privately-owned home until E.W. Marland built the Marland Mansion. The Calkins owned a prosperous mercantile business and were known for their magnificent art collection, including ornate tapestries, an extensive array of Oriental paintings, and numerous works by well-known American artists. The Oriental objects were of the same genre as the noted Matzene Collection at the Ponca City Public Library. (Gordon Matzene was a frequent visitor to the Calkins' home.) The alabaster chandelier that hung in the drawing room of the residence is now in the entry hall of the funeral home. The Trout Family founded their funeral home on the principles of "Character, Confidence, Value, and Trust." In addition to handling funeral services, they also operated a 24-hour-a-day ambulance service until 1968. The Trout Family was active in many facets of Ponca City life. E.M. Trout, Sr. was elected to the school board in 1929 and served for thirty-six years, twenty-nine as President of the Board. When he retired in 1965, he was honored by having the new elementary school named after him. E.M. Trout, Jr., later served as mayor of Ponca City. In 1977 Steve and Terry Huston purchased the business. Soon after purchasing the building, the Huston's remodeled the interior, and in 1987 a complete renovation of the structure was begun. Phase One included a state-of-the-art embalming and preparation room, new electrical, plumbing, and air conditioning, along with the addition of a stateroom and office. Phase Two, begun in 1991, was the completion of the new chapel, additional off-street parking, and three new state rooms. Gill-Lessert Funeral Home, Kay County's oldest family-owned funeral home (founded in 1894), merged with Trout Funeral Home in 1993, and M.G. Lessert joined the Trout staff. In early 1994, the first modular selection room in the state of Oklahoma was installed at Trout Funeral Home. In 2003 Mike and Jo Phenix purchased the Trout Funeral Home and Resthaven-Sunset Memorial Parks and began a new generation of caring for Ponca City families, insuring the community of continuous family ownership.